Happy Birthday to one of the best! – Welcome to the 2019 Beemie Awards! Wanted to wish a very happy birthday to my friend Robert Geller. Robert is the announcer at Emerald Downs (and Sunland Park) and has been since Emerald opened in 1996. I remember asking my dad when I was 15, “Is Gary Henson gonna announce at the new track?” He replied no, that instead they “hired some Australian guy.” I remember being bummed, because Gary Henson was my favorite. But I liked Robert’s personality and calls right away. 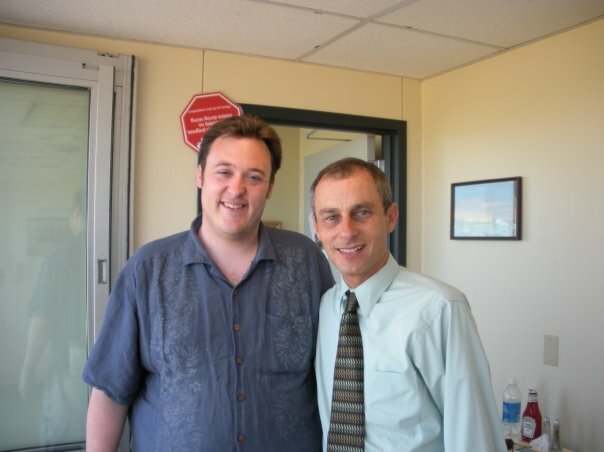 I still remember when I got hired by Emerald Downs in 2004 to work in the media office, the coolest part of the job was getting to meet Robert. He was as nice as he seems on air. I remember by the end of the year, I had been practicing announcing all spring in the suites next to the media office, and asked Robert if he’d listen to my tape. He immediately said yes and listened to my tape (which was probably awful). He immediately was supportive and said to keep practicing. Getting that message to continue on from him gave me a new lease on practicing and being excited about announcing and someday breaking into the business. Robert’s always been a supporter of mine and more importantly, has become a good friend. His character and talent still amaze me and he’s beloved by so many of us racing fans in the Northwest. A happy birthday to him and many many more!